AAMI, part of the group of insurance companies that fall under the Suncorp umbrella, are creating campaigns to encourage consumers to review and switch their motor insurance as the level of churn in the motor insurance category is known to be high. They wanted to use the opportunity to cross sell motor insurance from their existing home insurance customers based on the fact that the level of trust in the brand is high, making it likely that customers would switch. 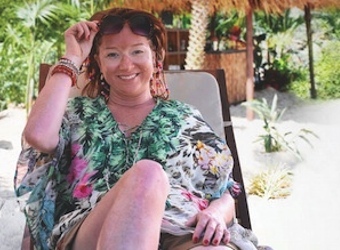 AAMI could also leverage the current Rhonda campaign as part of the creative message and her exotic destination as the hook for the major prize. Suncorp have been working with Arid Zone, a promotional products and brand promotion agency for a number of years and are always looking for ideas that are unique, relevant to their brand and campaign themes. 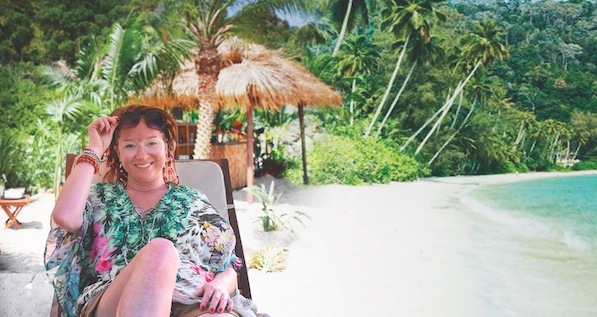 The campaign’s aim was to create a brand promotion that would deliver the key messages ‘Win a $15,000 dream holiday’ and ‘You can relax with AAMI Safe Driver Rewards’, targeting existing home insurance policy holders. collect data on targets’ current motor insurance status. 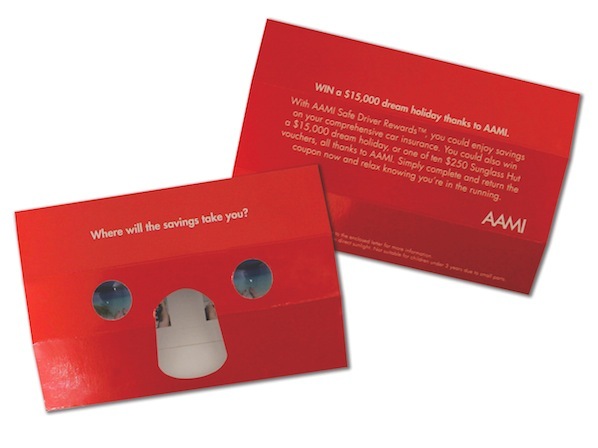 Arid Zone presented AAMI a new direct mail piece, the ‘stereo viewer’, to work with the ‘picture yourself here’ proposition. 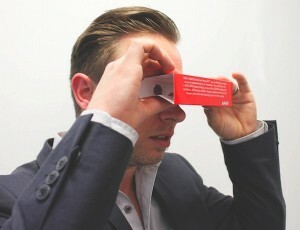 It works like a mini peep show, allowing recipients to look through the tiny windows to see a three-dimensional image. tell us when your motor insurance expires with another provider and we’ll contact you for a quote. The audience was sent a mail pack that consisted of a branded letter with a coupon entry slip, stereo viewer and a flyer explaining the promotion and how to participate. A microsite, luckyaami.com.au, was created as the online entry vehicle. We asked customers to nominate their renewal date with another provider to go into the draw to win the $15,000 holiday. We also asked them to indicate when their current comprehensive or third party or compulsory third party insurance expires. Life insurance was also included in the lead-capture form. The results were measured based on the number of leads generated and how many entries were received through the online entry mechanism and in hard copy by post. The goal of a 10% response rate was exceeded with the campaign achieving a 14% response rate. This included 4800 entries by coupon and 8922 via the online mechanism. A better than planned lead rate was also achieved. We were aiming for around a 20% lead rate and in the end achieved around a 25% lead rate.